Chef 1: A fourth-generation sushi chef who was born and raised surrounded by the world of sushi. He is also a sommelier and enjoys pairing sushi with wine and sake. 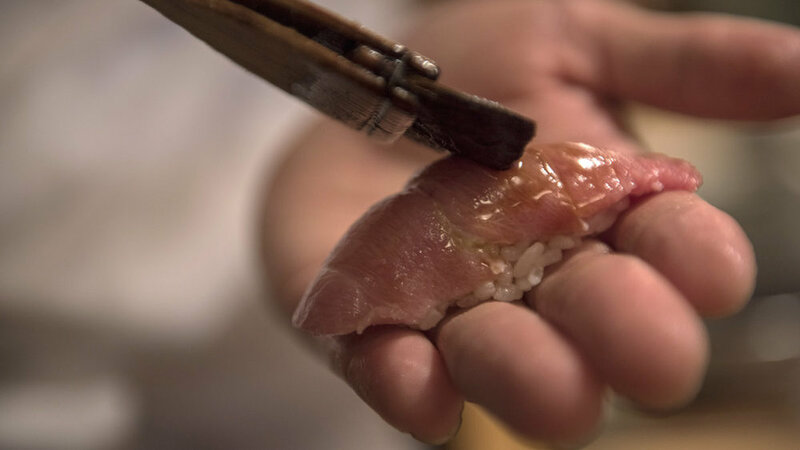 He places great emphasis on the importance of pleasing the customer through hospitality, conversation, and adjusting each sushi to the customer’s taste palate. He was previously invited by the Japanese government to be a sushi demonstrator at the Milano Expo. Chef 2: With a strong background in both sushi-making as well as Japanese cuisine, he is able to cater to almost any request. He has had experience working as head chef behind the counter of a Michelin star-rated restaurant. Eating at his counter is like being immersed in an all-encompassing work of art. From the moment you enter his domain, the cuisine, the atmosphere, and his deft movements create an all-encompassing performance. Chef 3: He has been honing his sushi-making technique since 1987. With experience working in both Tokyo and London, he has been called upon to help with the opening of numerous sushi restaurants. With experience training at high-end Michelin-starred restaurants, he maintains a fan base includes Hollywood actors and stars who visit him at his restaurant in Tokyo.